A casino mashed together with a sumo = Casumo, naturally. This quirky casino site has been thrilling the masses since 2012 and they've recently enjoyed a refresh of their offers. This obviously is good news for casino reviewer readers, but how do you claim? Once you've signed up you'll be gifted 20 free spins to use over a selection of Casumo casino slots. There's a good range too, so you can get a really good idea of what is on offfer and whether you even like the website. 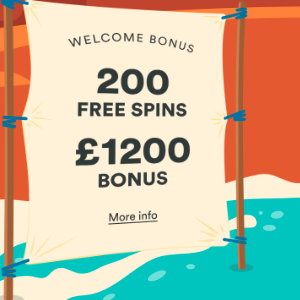 The good times don't stop there though because you'll receive 20 more free spins for 9 more consecutive days: some quick maths here means 200 free spins are yours over 10 days. The 200 free spins will rely on you depositing for the first time. Thankfully you'll get 200%, up to a maximum of £50, on this first deposit. Then if you go on to really love the site you will get 50%, 50%, 25% and 25% on your 2nd, 3rd, 4th and 5th deposits respectively. What do you make of that? Novomatic, Yggdrasil, Microgaming, Thunderkick and more make up super strong line up at Casumo -so it is so worth a look.